The first area to focus on is the landscaping. Keep your lawn neat and well maintained in every season. 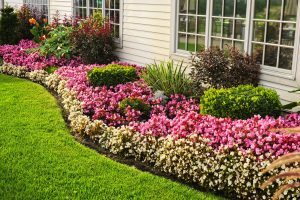 Plant colorful flowers, trim bushes and shrubs, and fertilize your grass to keep it healthy and green. By spending just a few hours a week on yard work, you’ll have a great looking lawn and garden that will catch the attention of passersby. Take advantage of a front porch by adding charming decor. Choose color schemes to decorate for each season, adding pretty flowers in pots, a wreath for the front door, and some stylish seating. Be sure to keep your porch tidy and free of clutter to really maximize it’s usefulness and attractiveness. Regular scrubs of the front porch will keep it clean throughout the year. A warm, welcoming front porch will really step up the look of your house. Don’t overlook the importance of your front windows, both upstairs and downstairs. Draw attention to the main window on the ground floor with stylish window treatments and tasteful seasonal decor. There are many color palettes to choose from that can work well with both the interior and exterior of your home at the same time. Curtains and blinds are a subtle, yet important element of a home’s curb appeal. Homeowners should always aim to keep their property looking great. You want your neighbors to be impressed, and you want to enjoy the beauty of your home’s exterior, too. Following these simple tips will help ensure that your house has curb appeal in every season. 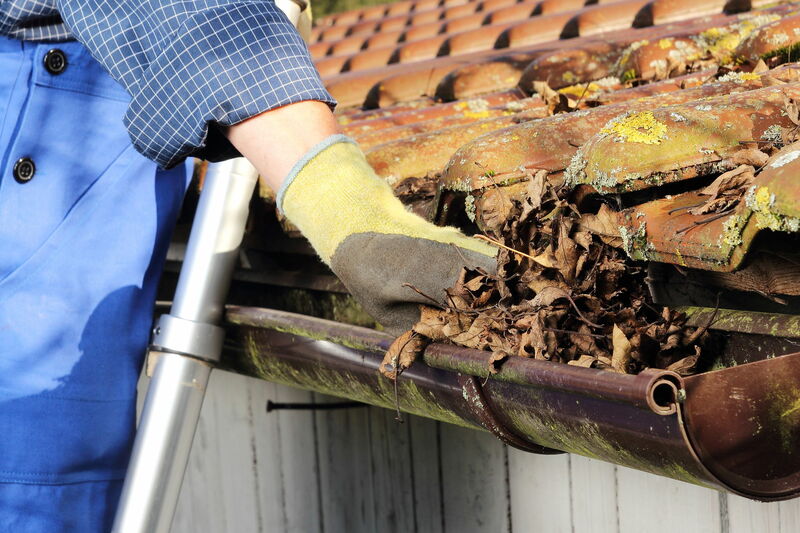 When inspecting, do not lean your ladder against any part of the gutter. This is because gutters are typically made from plastic or thin gauge metal, which can be damaged significantly by the pressure of a ladder. Using an A-frame ladder to climb to the appropriate height is a better idea. Before ascending the ladder, gather materials in a small pail or bag and carry them in such a way that you can still keep both hands on the ladder as you climb. Take a small plastic garbage bag, rubber gloves, and a two inch putty knife. With the plastic gloves on, pick up any twigs, leaves and piles of dirt you wish to dispose of and place them in the small garbage bag. The putty knife can be used to dislodge stubborn patches of dirt or decomposed leaves that have collected in specific areas. Clean each section and never reach beyond the point where you feel comfortable. Rather, climb down the ladder and reposition it for the next section. When you are finished cleaning, rinse the area with a garden hose to remove tiny pieces of debris that you may have overlooked. After checking the gutters for cleanliness, tap in nails or tighten screws that may have become loose throughout the year. If you discover that the downspout is completely plugged or slow to drain, give it a strong spray from your garden hose to push out any debris. However, if the downspout reaches directly into a drain, the connection should be undone first so that you do not inadvertently push debris into the drain and create another problem. Finally, if you complete an October inspection and discover roof problems or suspect that it is time for new gutters, be sure to get a gutter system with built-in gutter covers.